Sunedison is having a great time in the market at the moment after announcing that it has canceled a $3.45 billion deal. Today, we’ll talk about the deal that was canceled, what we’ve seen in the market as a reaction and what we can expect to see from SUNE moving forward. For quite some time, Sunedison has been in talks with a Brazilian renewable energy company by the name of Renova Energia. If the deal would have went through, TerraForm Global, a subsidiary of Sunedison would have purchased generation assets in a share swap that was valued at $3.45 billion. Recently, there were signs that the deal was not going to go through. Earlier in the year, Sunedison decided not to transfer $250 million worth of shares in exchange for a 15% stake in Renova. This was a sign that the deal wasn’t going to go through because this transfer was a previously state condition of the larger deal which has been canceled. It was clear that investors didn’t want this deal to go through based on the response we’ve seen in the market as the result of the cancellation of talks. Since the deal has been knocked down, we’ve seen a gain of more than 15% on the stock. 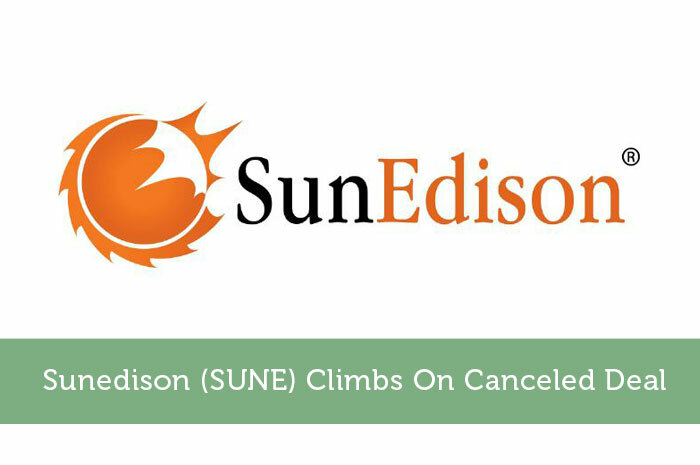 Sunedison is a company that is focused on the manufacturing and sales of solar panels and other renewable energy products. Unfortunately however, the energy industry has been struggling for quite some time now. While the struggles in the energy industry are more focused on oil than renewable energy, it’s important to remember that the entire energy industry is involved in this crisis. With that said, I’m not expecting to see any exponential gains that will last for the long run until we see a rebound in the energy industry. Sadly, I’m not expecting to see a rebound in the energy industry as a whole for quite some time. The reality is that the energy industry is centered around oil, and when it comes to oil, the outlook is looking relatively grim. Oil has been falling for quite some time, and for good reason. The commodity is heavily dependent on supply and demand, and at the moment, supply of oil far outweighs the demand for the commodity. With economic struggles worldwide, I don’t see demand rising any time soon and with each of the world’s oil producers vying for market share, it doesn’t make sense that supply is going to fall. The bottom line here is that while SUNE is focused on renewable energy, until the oil market rebounds causing an energy sector rebound, we can continue to expect lackluster growth at best. Where do you think SUNE is headed and why? Let us know your opinion in the comments below!